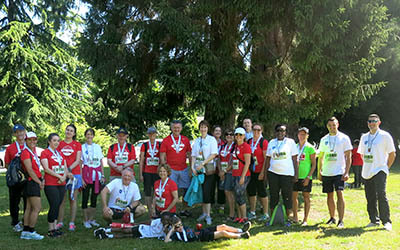 Thanks to the support of Justice Institute of British Columbia (JIBC) students, staff, faculty and friends, more than $12,000 has been raised by members of Team JIBC running in the 18th annual Scotiabank Vancouver Half-Marathon and 5K Charity Challenge on June 26, 2016. The Justice Institute of British Columbia Foundation (The JIBC Foundation) was one of 80 charities registered for the event, and it was eager to make every step count to fundraise for important priorities like scholarships, bursaries and new equipment that supports student success at JIBC. The charity challenge was a collaborative effort shared by a variety of community stakeholders who care about JIBC students and helped Team JIBC surpass its fundraising goal of $10,000. 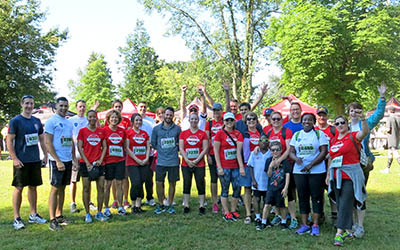 The Scotiabank Vancouver Half-Marathon & 5K Charity Challenge has raised more than $4.8 million dollars for over 120 local charities since its inception. All funds raised goes directly to each charity. Although event day is over, there is still time to help Team JIBC’s fundraising efforts. Online fundraising closes at 5:00pm on Monday, July 25th, 2016. For more information about the Charity Challenge, contact the JIBC Development Office at 604-528-5877 or, go to JIBC.ca/charitychallenge.